Creamy Mash Potato is a totally comforting side dish. But why not give it a nutrition boost by using a mixture of root vegetables, rather than just potatoes? Anything goes with this Vegetable Mash and not only does it add lot of extra vitamins, but flavour and colour too. A great addition to any roast dinner! 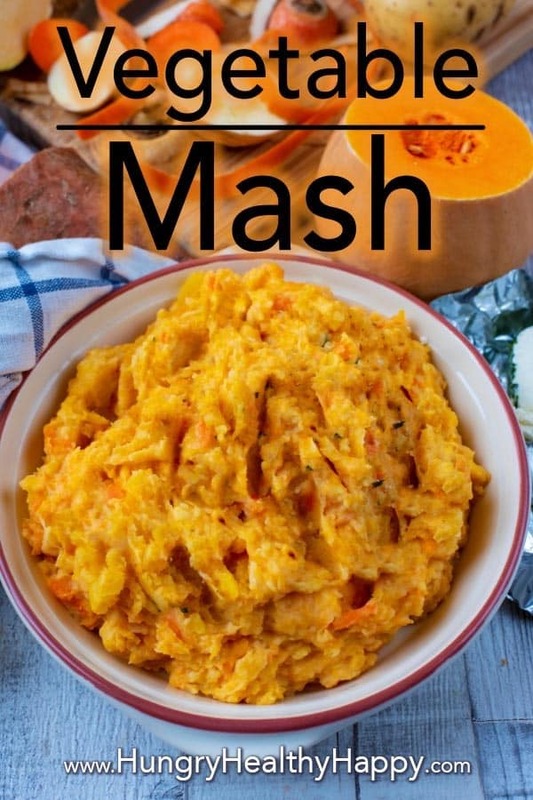 We are always looking for more ways to get vegetables in to our diet and this vegetable mash is a really easy way. It’s like a classic mashed potato dish, but with 5 other vegetables mixed in. Still all that creamy and comforting flavour, but with a nutrition boost. If your kids aren’t huge vegetable fans, then this is a great way for them to enjoy them more. Everyone loves creamy mash, right?! You honestly can’t taste the difference, especially when it is loaded with sausages and gravy. 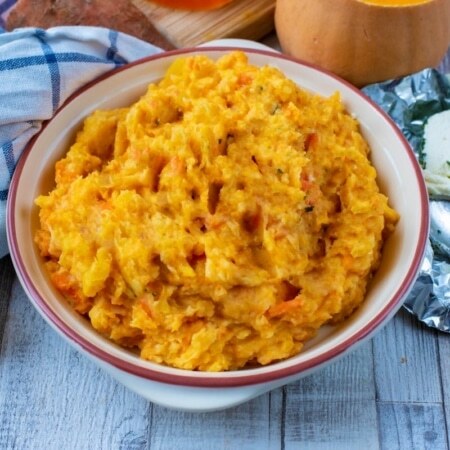 Pretty much anything goes when it comes to this vegetable mash, but we used a mixture of white potatoes, carrot, butternut squash, parsnip, swede and sweet potato. You could add some softer vegetables like cauliflower or broccoli, but I think root vegetables are best. 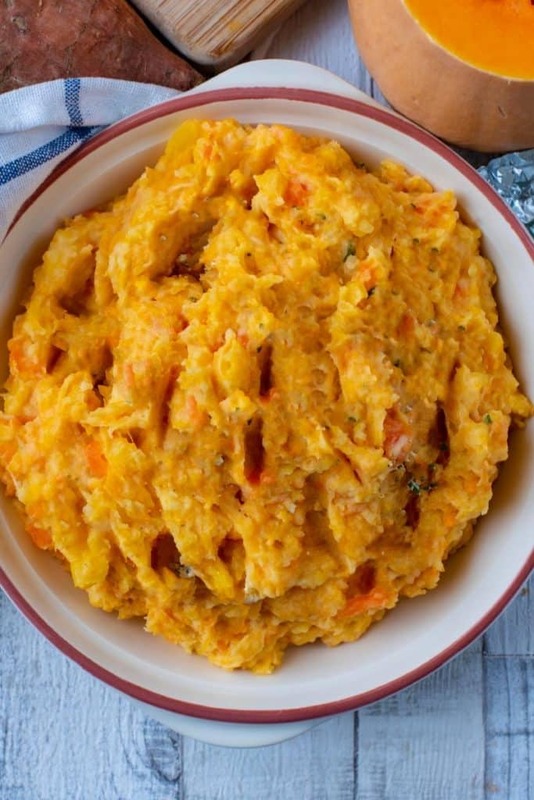 Using carrots in this vegetable mash makes it nice and sweet, and adds plenty of colour too. We went one step further and used butternut squash and sweet potato for even more sweetness and some extra orange colour too. Mash has to be creamy in my opinion. I don’t like lumps in it, so I like it nice and smooth with a creamy consistency. We do this by adding a little bit of milk and herb creamy cheese after the vegetables have been mashed. You can use grated cheddar, or a plain cream cheese, but I think a herb cream cheese adds lots of extra flavour. Can You Make it in the Microwave? The recipe below is for mash made on the hob, but we often make it in the microwave too. What is the advantage of making it in the microwave? It takes less time, and it saves space on the hob which is essential when you are cooking for a big crowd. To make it in the microwave, just add all the vegetables to a microwavable bowl, cover and then cook for 8 minutes. Then mash and continue to follow the instructions below. Can You Freeze Vegetable Mash? Yes, you can can freeze this side dish and it would save you even more time when you are making a roast dinner. To freeze, wait until the mash has cooled down and then add big scoops on to a lined baking tray (so you have several mounds of mash) and then put in the freezer. Once they are frozen, you can put them in a freezer bag and back in the freezer, and then take out a lump as and when you need it. You can reheat it on the hob, in the oven or in the microwave. The key to successfully freezing mashed potato is to make sure it has plenty of fat in it, so make sure to add milk, butter and cheese. We serve it with sausages, chicken, any kind of roast meat on a Sunday. However, this creamy vegetable mash makes a great topping for shepherd’s/cottage pie. A traditional comfort food dish that you can give a little vegetable boost to. One: Add the cubes of vegetables to a pan of boiling water and simmer for 10-12 minutes. Two: Drain the vegetables and put them in a bowl and mash until desired consistency. Three: Stir in the milk and cream cheese, if using, and serve. Feel free to use a mixture of vegetables, and you could even add some broccoli and cauliflower too. You don’t have to make this mash creamy, but a little bit of milk and some cream cheese make it extra creamy and comforting. You can cook this on the hob, but it also cooks well in the microwave. If you are going to freeze the mash, make sure it has plenty of fat added to it otherwise it won’t freeze successfully. 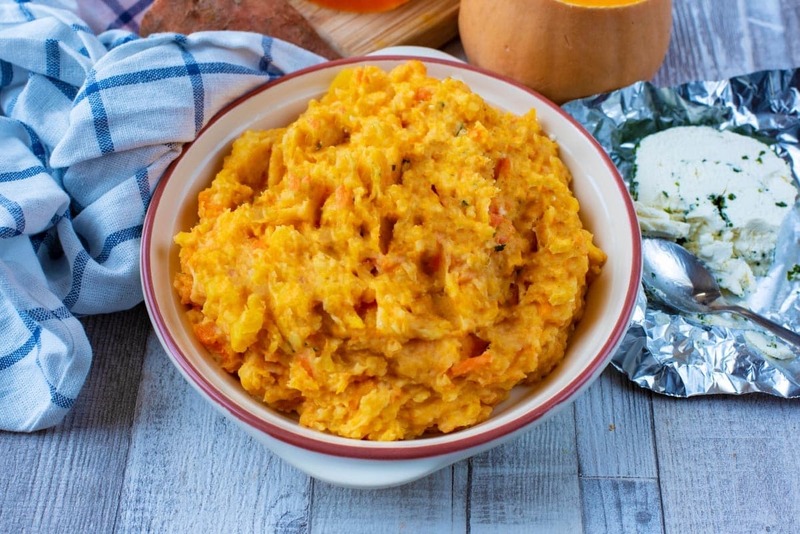 Do you want to be kept up to date on more delicious posts like this Vegetable Mash? Please subscribe to the blog mailing list (it takes 30 seconds). 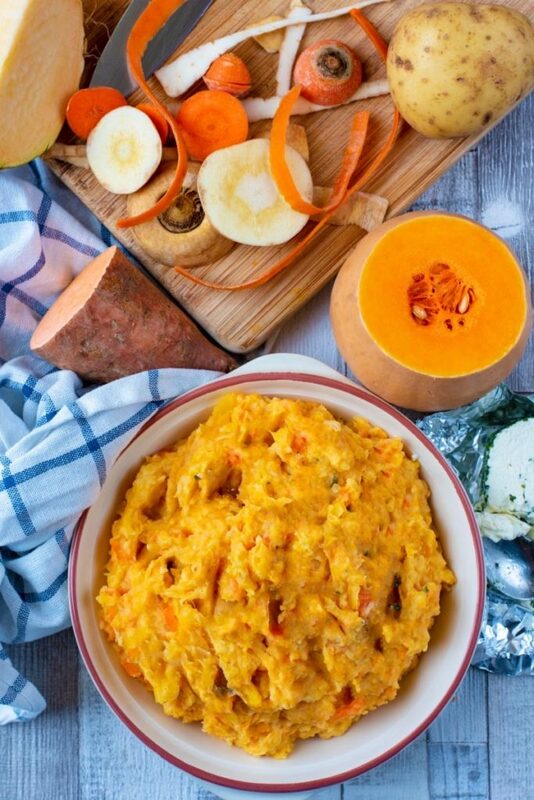 If you’ve tried this Vegetable Mash, or any other recipe on the blog, then let us know how you got on in the comments below, we love hearing from you! You can also FOLLOW US on FACEBOOK, TWITTER, INSTAGRAM and PINTEREST to see more delicious recipe ideas, behind the scenes shots and also what we are getting up to. Anything goes with this Vegetable Mash and not only does it add lot of extra vitamins, but flavour and colour too. A great addition to the Christmas Day table! Add the cubes of vegetables to a pan of boiling water and simmer for 10-12 minutes. Drain the vegetables and put them in a bowl and mash until desired consistency. Stir in the milk and cream cheese, if using, and serve. You don't have to make this mash creamy, but a little bit of milk and some cream cheese make it extra creamy and comforting. Love all the veggies you used! So delicious! A perfect side dish to add to our Easter menu! I’ve done parsnip and cauliflower mash, but I haven’t tried it with squash. I’ll give it a go! And I agree you have to mix veggies in with some potatoes to get the best consistency (and fewest complaints)!